Leatrice Joy (born Leatrice Johanna Zeidler; November 7, 1893 – May 13, 1985) was an American actress most prolific during the silent film era. Riverdale, Bronx, New York, U.S.
Joy was born in New Orleans, Louisiana to dentist Edward Joseph Zeidler, who was of Austrian and French descent, and Mary Joy Crimens Zeidler, who was of German and Irish descent. She had a brother, Billy, who later worked at Metro-Goldwyn-Mayer. She attended the Convent of the Sacred Heart in New Orleans, where she had planned on becoming a nun, but left when her father was diagnosed with tuberculosis and forced to give up his dental practice. She tried out for the New Orleans-based Nola Film Company in 1915 and was hired as an actress. Her mother disapproved of her becoming an actress, but the family needed the money, so her mother accompanied her to California where she began working in plays and films. Joy began her acting career in stock theater companies and soon made her film debut; between April 1916 and November 1917 she was the star of about 20 one-reel Black Diamond Comedies produced by the United States Motion Picture Corporation in Wilkes-Barre, Pennsylvania, and released nationally by Paramount Pictures. In many of these, she starred as "Susie," an irrepressibly enthusiastic, impulsive young woman who gets into humorous scrapes. In late 1917 she relocated to the relatively young film colony in Hollywood, California and began appearing in comedy shorts opposite Billy West and Oliver Hardy. Signed under contract with Samuel Goldwyn Studios, her first role for the studio was in 1917's The Pride of the Clan opposite Mary Pickford. Her career quickly gained momentum, and by 1920 she had become a highly-popular actress with the filmgoing public and was given leading-lady status opposite such performers as Wallace Beery, Conrad Nagel, Nita Naldi, and Irene Rich. Directors often cast Joy in the "strong-willed independent woman" role, and the liberated atmosphere of the Jazz Age Roaring Twenties solidified her public popularity, especially with female film goers. Her close-cropped hair and somewhat boyish persona (she was often cast as a woman mistaken for a young man) became fashionable during the era. With her increasing popularity, Joy was sought out by Cecil B. DeMille, who signed her to Paramount Pictures in 1922, immediately casting her in that year's successful high-society drama Saturday Night opposite Conrad Nagel. Joy starred in a number of successful releases for Paramount and was heavily promoted as one of DeMille's most prominent protégées. In 1925, against the advice of studio executives, Joy parted ways with Paramount and followed DeMille to his new film company, Producers Distributing Corporation, for which she made a few moderately-successful films, including Lois Weber's last silent film The Angel of Broadway in 1927. A professional dispute ended the DeMille/Joy partnership in 1928 and she was signed with MGM. That year she headlined MGM's second part-talkie effort, The Bellamy Trial opposite Betty Bronson and Margaret Livingston. Joy's career began to falter with the advent of talkies, possibly because her heavy Southern accent was considered unfashionable in comparison with other actresses' refined "mid-Atlantic" diction. In 1929 she became a freelance actress without a long term contract. In order to improve her chances of regaining her film career, she undertook a vaudeville tour from 1929-1931, as a training ground for returning successfully to talkies. She was particularly interested in improving her voice and learning how to better handle dialogue. By the early 1930s, Joy was semi-retired from the motion-picture industry, but she later made several guest appearances in a few modestly-successful films, such as 1951's Love Nest, which featured a young Marilyn Monroe. In the 1960s, Joy retired to Greenwich, Connecticut, where she lived with her daughter and son-in-law. Joy appeared as a subject on CBS TV's game show, To Tell the Truth July 1, 1963. She was interviewed in the television documentary series Hollywood: A Celebration of the American Silent Film (1980). Joy was married three times and had one child. On March 22, 1922, she married actor John Gilbert. They had a daughter, Leatrice Joy Gilbert (later Fountain; September 1924 – 20 January 2015), who later acted in bit parts. Joy filed for divorce in August 1924, citing Gilbert's infidelity and alcoholism. Joy's second marriage was to businessman William Spencer Hook on October 22, 1931; they divorced in 1944. Joy's third and final marriage was to former actor and electrical engineer Arthur Kem Westermark. They married on March 5, 1945 in Mexico City and divorced in October 1954. During her silent film career in the 1920s, she was Hollywood's best known Christian Scientist. On May 13, 1985, Joy died from acute anemia at the High Ridge House Christian Science nursing home in Riverdale, Bronx, New York. She was interred at the Saint Savior Episcopal Churchyard in Old Greenwich, Fairfield County, Connecticut. For her contribution to the motion picture industry, Leatrice Joy has a star on the Hollywood Walk of Fame at 6517 Hollywood Blvd., in Hollywood, California. 1954 Robert Montgomery Presents Episode: "The Steady Man"
^ "New Orleans, Louisiana Birth Records Index, 1790-1899". Vital Records Indices. State of Louisiana, Secretary of State, Division of Archives, Records Management, and History. 101: 520. 2002. ^ Wayne, Jane Ellen (2006). The Leading Men of MGM. Da Capo Press. p. 84. ISBN 0-786-71768-8. ^ "Leatrice Joy in Paramount Comedies". The Moving Picture World. June 30, 1917, page 2084. Retrieved December 12, 2012. ^ "Former Film Star Ends Stay at Beach". The Los Angeles Times. May 24, 1962. p. F14. ^ "Leatrice Fountain's Obituary on GreenwichTime". GreenwichTime. 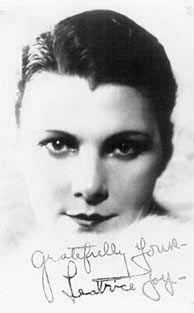 ^ "Leatrice Gilbert Fountain (1924-2015): Daughter of Hollywood Legends". 25 January 2015. ^ LaSalle, Mick (July 6, 2005). "Saved from ignominy/His daughter's stubborn campaign put unfairly maligned actor John Gilbert back in the pantheon of silent film stars -- where he's always belonged". sfgate.com. Retrieved January 6, 2016. ^ "Leatrice Joy Asks Divorce". The Telegraph-Herald. August 3, 1924. p. 22. Retrieved February 12, 2013. ^ Arnold, Thomas K. (March 23, 1988). "Symphony to Screen John Gilbert Classic Daughter Speaks Up About a Silent Legend". The Los Angeles Times. p. 1. ^ "Leatrice Joy Has New Role; Through With Film Career". The Telegraph-Herald and Times-Journal. October 22, 1931. p. 1. Retrieved February 12, 2013. ^ "Leatrice Joy Wed Electrical Engineer". The Evening Independent. March 14, 1945. Retrieved February 12, 2013. ^ "Leatrice Joy Divorced". The New York Times. October 22, 1954. p. 24. ^ "Leatrice Joy, 91, Dies; Actress in Silent Films". The New York Times. May 18, 1985. ^ "Featured in DeMille's 'The Ten Commandments' : Silent Film Star Leatrice Joy Dies at 91". The Los Angeles Times. May 15, 1985. Retrieved 2014-01-27. ^ "Hollywood Star Walk". latimes.com. Retrieved February 12, 2013. Wikimedia Commons has media related to Leatrice Joy.